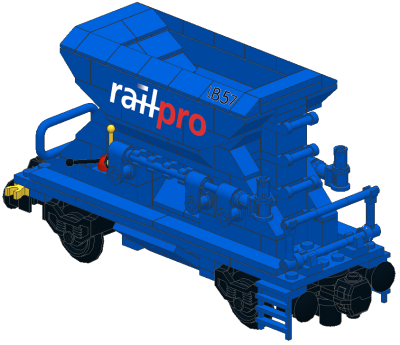 Very detailed 'RailPro' gravel wagon, used for the maintenance of the railbedding. Functional handles to open the inside flaps on the operator platform and moveable flaps underneath to spread the gravel to the inside or outside of the track. There are build over 200 of these wagons on frames of older freight cars. They can contain a maximum of 22 m3 gravel and a weight of 29 tons of gravel. Also available as set of 3 for a reduced price.